Help our friends at the Mutual Aid Network (MAN) build local, resilient, peer to peer economic networks through their crowdfunding campaign. What would it look like if everyone were doing the work they loved; what they felt called to do? What if everyone had the opportunity to build their skills to their maximum capabilities and then apply them to making their communities whole and beautiful? Mutual Aid Networks are a new type of cooperative, designed to connect us in a network of mutual support that creates means for us to do exactly what we want to do with our lives, from solving hard problems to taking care of loved ones and neighbors to making art. We can be the Job Creators! The aim of Mutual Aid Networks is to redesign how we work; to apply what we know about economic and community building tools to create a new vision for work. Instead of getting jobs so we can afford to live, we decide how we want to live and create community supports for each other to do what we want to do. We want everyone to become the inventors, freelancers, entrepreneurs, homemakers, artists, and caregivers they want to be, with some material security because we choose to provide that to each other. 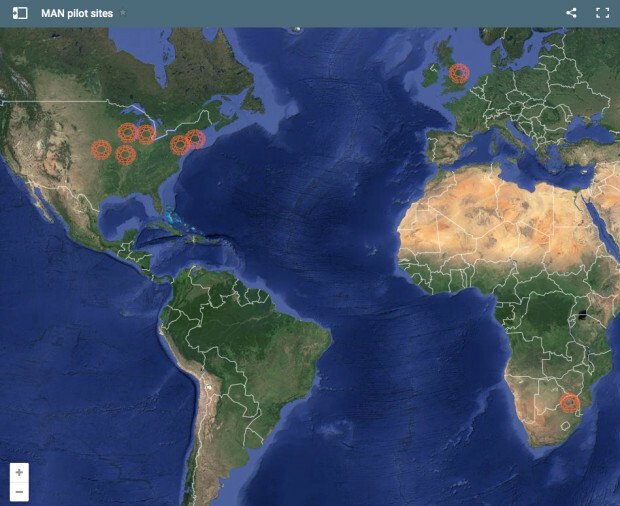 Please support our pilot sites by clicking on their crowdfunding links above and learn more about each pilot on our website by clicking the map below. The Main MAN meta-cooperative now links the pilots together to create comprehensive budgeting tools that track all forms of capital – TimeBank hours, mutual credit, shared resources, and community savings and lending pools. These online tools connect individuals, organizations, and projects. This crowdfunding campaign will provide us with the money we need to develop our infrastructure via software, communications tools, training and travel, outreach and more. And because we manage our wealth in innovative ways and connect it with cooperative tools and practices, it goes much much farther than it would in a traditional giving model. We are using open sourced project coordination software now and we’ve built a team that can adapt it to meet our unique needs. The platform links pilot projects to technical assistance, shared materials resources, and shared learning across different cultures, geography and countries. Hundreds of hours have been donated to date. Your contributions will help cover out of pocket expenses for programmers and organizers. Please support us in creating the new economy, one that works for the 100%! Mutual Aid Networks are the brainchild of The Dane County TimeBank, a mutual credit time exchange and Time For the World, our project to learn from and share what we’re doing with communities working on similar efforts around the world.